Pi Kappa Alpha International continues to take a leading role in defining college fraternities as worthwhile organizations on campus, in local communities, and throughout our country. In an effort to alert college students, members of the college community, and the public, of the dangers of addiction, Pi Kappa Alpha has formed a partnership with the Center on Addiction, formally known as the National Center on Addiction and Substance Abuse. Founded in 1992, the nonprofit Center on Addiction works to find, promote, and enact the necessary solutions to end America’s deadly addiction crisis. With over 200,000 living alumni, and over 15,000 current students representing 225 colleges and universities in North America, Pi Kappa Alpha can have an enormous influence on college campuses and their surrounding communities. The Center on Addiction Executive Chair is Joseph Plumeri, Gamma Chapter ’64, former CEO of Citibank North America. He hosted the Night to Imagine gala at the Pierre Hotel in New York City. At this gala, the Center on Addiction unveiled its’ new strategy of putting knowledge into action to combat the drug epidemic that is sweeping the United States and Canada. At that time, it was revealed that Pi Kappa Alpha would be playing an active and leading role to accomplish the goals of the Center on Addiction. As such, Pi Kappa Alpha was introduced as a vice chair sponsor of this event. 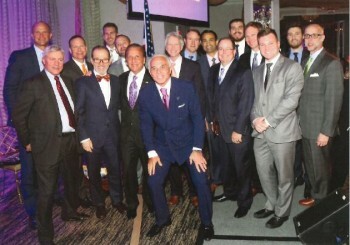 Nearly two dozen Pi Kappa Alpha alumni and guests were in attendance including our very own Bruce Wolfson, Beta Pi ’71. Pi Kappa Alpha’s participation in this endeavor strengthens its’ reputation and standing as the foremost leader in educating its’ members in the entire fraternity world. The role taken on by Pi Kappa Alpha is to educate our alumni and student members to create an awareness of the drug crisis on every campus. These members can serve as advocates at college and in the local community. Pi Kappa Alpha can lead the fight against addiction by investing the manpower and experience it has shown in the past to develop young men capable of having a positive influence on others.